Would it be cool to update the invision logo? Not that ugly, but modernize it. Just a suggestion, a template below. Its good, but this forum have "fullname" - invisionvirus. Your "virus" is subname now. Try change it. Current IMO looks better and I wouldn't change it. In general the modern style is ugly, what is looking good on flat icons? It looks like we are back in windows 95 or so and we are to stupid to use a grafic program in the right way. 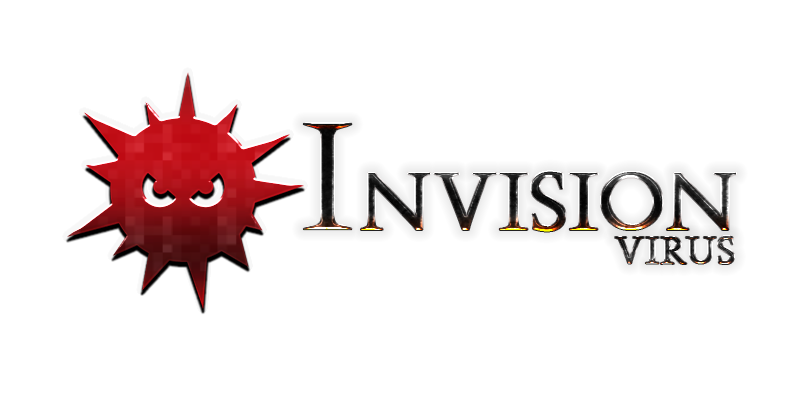 All iv logos are with the font you can see in the logo and i will not use another. Good job man, really, i apreciate your work ! That's mark for this website for long-long time John. Logotype is not bad but i think that Invision-Virus just should "refresh" actually original logotype. You know, that's like Nike, Adidas. That's the face for the website and whole community. I could make remake if AT's are interested - i mean to "improve" this original styling. Change the font,and gamma ,pute stroke on 1px inside. This font, mix of colors and gamma of text are steange...i loved the logo icon. I really like this logo, but like other users have said, I would personally change the font to something more modern, or sleek. Other than that my guy, the graphic looks well made!